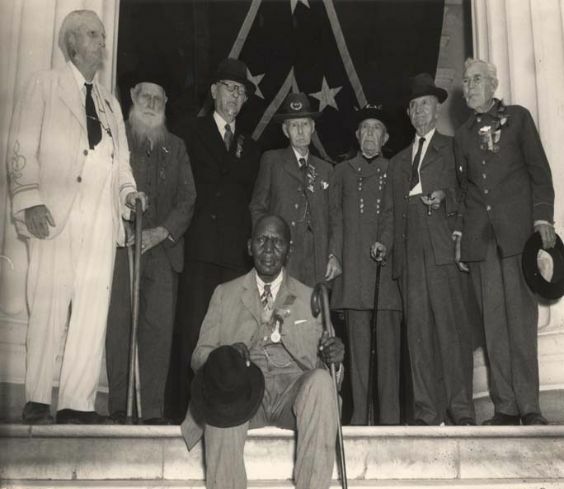 Description Standing, left to right: General William Banks of Houston, Texas; General W. W. Alexander of Rockhill, South Carolina; General J. D. Ford of Marshall, Texas; General T. H. Dowling of Atlanta, Georgia; General James W. Moore of Selma, Alabama; Colonel W. H. Culpepper of Atlanta, Georgia; and General W. M. Buck of Muskogee, Oklahoma. Seated in front is Dr. R. A. Gwynne of Birmingham, Alabama, the only African American to attend the reunion. This image was used and identified in the Alabama Historical Quarterly, Volume 6, page 6 (1944).